True confession? I have had no idea what day of the week it is all day! With me playing the nurse for Bug last week, our schedule and routines were dislocated and discombobulated. I missed church on Sunday which always throws the week out of whack– I feel like I’m stuck in a perpetual Saturday! Now, I’m visiting family out-of-town which of course throws another curve ball of weirdness into what day of the week it “feels” like! Weeks like this hit me when I’m starting to feel like I have it all together. I’m flying high as supermom— I get organized and structure our days and plan the family’s orderliness all to have it fall apart in a matter of a few days. It’s a reminder that life happens. So, you got me. I momfess it– I’m only human. I should floss everyday. I know I should. I intend to after each visit to the dentist. And then standing at the mirror brushing before bedtime, I realize that if I skip flossing, I can get in bed a minute earlier. Worth it? For this wiped out mom: totally! Anyway, to throw the hygienist off our tails, we start flossing daily when we get the reminder cards in the mail about our next dentist appointment. So we floss daily for 1-2 weeks before our appointment and they are none the wiser when we get cleaned! They think we’re faithful flossers! Whew! Some things you just need to get off your chest! If you’re a mom, you probably have a “momfession” or two to make. I have plenty, I’m sure, but am always short-handed when I’m supposed to tell about an embarrassing moment or sticky situation. I’ve got a good one today. We stopped at two gas stations, but they were both closed. At 6:00pm on a Saturday– I know, right! We were out in. the. middle. of. nowhere. I tried to hold it. But we were lost. (Thank you shady internet directions.) So I told Hubby to pull over. Yes, I peed behind a tree! Can you believe it? I had to chuckle as I crawled back in the car. The saddest part of the whole ordeal– I just kept thinking what a great blog post! 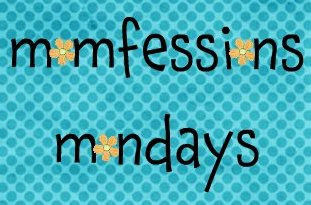 Go ahead, share your own momfession– you know you want to! Before I could drive myself to school, my shuffling occasionally had to be hurried along, since a neighbor who attended my high school drove me to school. She often sat in the driveway while I made the last minute dash around collecting my belongings and grabbing something to eat. One morning I made the mad dash and sunk into the seat of her car, relived to be able to sit and zone for the 15 minute drive to school. All of the sudden, I realized something was not quite right with the world. I had forgotten a very important piece of “underwear” as I had gotten ready, half-asleep. What in the world? I know, I know. This piece of underwear had been a part of my everyday garb since fourth grade, so I’m not exactly sure how it slipped my mind to put one on before pulling on my shirt. I panicked and formulated a plan. 2. Instruct her to drop everything she was doing and bring me a bra. 3. Make sure she understands the delicacy of the situation and treats said bra with utmost secrecy and urgency during delivery. So, thirty minutes later or so, I was called out of class to the office. (Good thing it was just Calculus, I hadn’t understood anything in that class all year anyway.) I received “the package” from mom in the office and proceeded to the nearest restroom to complete the mission of getting fully dressed for the school day. Success! So my moment was one of those that was completely mortifying to me… but luckily the rest of the world was spared my tenth grade soap opera drama. What about you? Not sure how to play along? 1. Post about your “moment of glory” on your blog. 2. Click on the title of your post so the only post showing on your page is the one you just wrote. 3. Copy the address of that post. 4. Come back here to Momfessions. 5. Type your name in Mr. Linky, and then paste the address to your embarrassing moment post.